A large number of recent renal transplantations are performed from the deceased donor kidneys. The vascular and structural status of the kidney is the most important determinant of the prognosis of the transplantation. Estimation of renal function of deceased donor is mostly limited to the evaluation of plasma urea and creatinine in routine practice. However, preoperative detection of functional status of the deceased donor kidneys is possible by means of scintigraphic methods. During the brain death, a series of events occurs in tissues all over the body. These changes include increase in expression of adhesion molecules, leukocyte infiltration, and serum cytokine levels. Inevitably these tissue-based changes possibly can lead to malfunction of graft tissues. Especially, the catastrophic effects occurring in the vascular system of the graft cause loss of function of graft tissue. Reports on the investigations related to this dynamic process are very limited in the literature. We previously reported the consequences of brain death in the brain tissue in a rat model with comparison of scintigraphic findings. The aim of this recent study was to investigate the effects of brain death in the kidney tissue and demonstrate if dynamic renal scintigraphy can express these findings in comparison to the histopathologic results. All animal protocols were approved by the Institutional Animal Care and Use Ethics Committee. The study was conducted according to the National Institutes of Health Guide for the Care, and Use of Laboratory Animals and Helsinki Declaration revised in 2008. Ten Sprague-Dawley male rats (2–3-month-old, approximately 250–300 g) were included in the study. All the studied animals were killed after the study. Sedation was performed by intramuscular administration of 35 mg/kg ketamine and 10 mg xylazine before all the imaging and surgical procedures were performed. Dynamic renal imaging was performed before and after brain death. Control scintigraphy was performed on all the rats by injection of 37 MBq (1 mCi) Tc-99m DTPA to the tail vein. Immediately, after brain death confirmation, dynamic renal scintigraphy was performed with the same parameters of control scintigraphy. The imaging was performed by a single-photon emission computed tomography gamma camera (General Electric, Infinia 2, Israel) equipped with low-energy high-resolution collimator in 64 × 64 matrix in dynamic manner (1 s/frame for first 60 s and 30 s/frame for other 18 frame totally 10 min) after IV bolus administration of 1 mCi Tc-99m DTPA through a venous line in the tail with a consecutive saline flush. Interpretation of the scintigraphy images was performed by an experienced nuclear medicine physician. In addition, images were analyzed by renal analysis program in Xeleris workstation. The age, height, and weight information were recorded. Renal and background region of interests were generated from the kidney (including pelvic region) and infrarenal background regions. 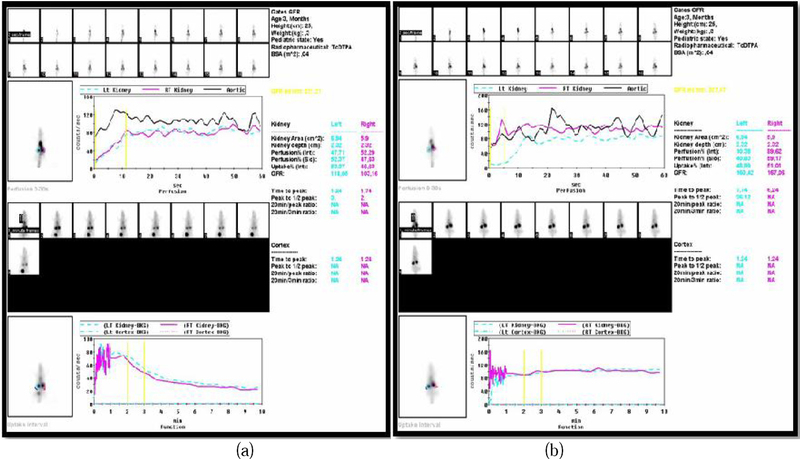 The camera-based glomerular filtration rate (GFR) and time to maximum concentration (Tmax) values and renogram curves were obtained and evaluated. Venous blood samples were obtained in before and after brain death, and urea and creatinine levels were measured by Olympus AU 600 analyzer. Brain death was produced by the localization of a balloon catheter (4-F Fogarty catheter) into the intracranial cavity through a burr hole between parietal bones, filling the catheter with 0.5 mL saline infusion until the maximal pupil dilatation, apnea, and loss of reflexes were observed as previously described. Intubation was performed from tracheostomy cannula, which was previously generated. The second scintigraphy was performed under intubation and monitorization. Immediately, after scintigraphy, we kill the rats, and the brain and kidney tissues were removed for pathologic analysis. Brain and kidney tissues were fixed in 10% formaldehyde solution. After fixation, the tissues were washed with regular water. After dehydration and polishing, the tissues were embedded in paraffin, and slices of 5–6 μm were obtained. After deparaffinization and rehydration, hematoxylin-eosin staining was performed. The preparations were analyzed by light microscopy (Olympus BX 50; Olympus Optical CO., LTD., Tokyo, Japan) with ×400 magnification and ×100 magnification in 10 different areas. Numeric variables (counts) that were obtained from the process of the images were compared by Wilcoxon test, and P <0.05 was considered statistically significant. In the visual interpretation of scintigraphy loss of tubular functions (concentration and excretion) were observed in all subjects [Figure 1]a and [Figure 1]b. In addition, after brain death compared to control scintigraphies, the GFR and Tmax values in scintigraphies and plasma urea and creatinine levels were elevated significantly [Table 1]. Table 1: Parameters and their P values before and after the brain death. Figure 1: Dynamic renal scintigraphy of the subjects before (a) and after (b) the brain death. Histopathologic analysis confirmed brain death in all of the subjects with typical marks of brain death, including severe autolysis, hydropic degeneration in cytoplasm, shrinkage in the nucleus, pyknosis, and petechial hemorrhage all over the brain in pericellular space. Histopathologic analysis of kidney tissue revealed congestion of the vessels, hydropic degeneration in tubule epithelium and focal infiltration of lymphocytes which were consistent with acute tubular injury [Figure 2]a,[Figure 2]b,[Figure 2]c.
Figure 2: Histopathological appearance of the kidney tissue after brain death. Vascular congestion (a), lymphocytic infiltration (b) and hydropic degeneration (c) are observed. In this study, we aimed to evaluate the tissue-based changes in the kidney related to brain death. The acute phase changes include acute tubular injury in the kidneys which explains the high frequency of acute tubular necrosis observed in the deceased donor kidney transplants. We confirmed the acute tubular injury in the graft tissue both by histopathology and scintigraphy. Scintigraphy is a decent method of demonstrating the tissue-based changes in the kidney tissue which is confirmed by the previous deceased donor graft evaluations. Our study confirms the correlation of scintigraphic and histopathologic findings for the first time in the literature as far as we know. Since scintigraphic estimation of renal function depends on tissue function instead of morphology, it provides more reliable and detailed information about the status of the kidney. GFR estimation performed as Gates method although not accepted a reliable indicator was calculated to be higher in the early brain death period in our study and as in the previous studies. By this experimental study, we were able to confirm the reliability of renal scintigraphy in assessing the quality of kidneys in the brain dead donors. Dynamic renal scintigraphy and ultrasonography are the most frequently used imaging modalities in the determination of graft function in renal transplant recipients. Renal scintigraphy is the test of choice in the evaluation of grafted kidneys. Serial scintigraphic imaging is recommended for especially complicated transplanted grafts. Comparative studies have shown that radionuclide imaging is specific for identifying acute rejection and cyclosporine toxicity. In a previous study, a group of researchers performed radionuclide angiography in the estimation of graft vascularity with a different isotope Tc-99m human serum albumin in deceased donor kidney and pancreatic grafts. However, the diagnostic role of renal scintigraphy in the deceased donor donor is not established yet. There are several studies indicating the performance of radionuclide estimation in the deceased donor donors. However, the usage of nuclear medicine methods is limited because the time to remove the potential grafts should be as short as possible. In ideal circumstances (classical deceased donor donors), it is possible to skip the detailed evaluation of the graft tissue. However, if the donor is pediatric, hypertensive or elder patient, further imaging for graft functions is necessary.,, Pediatric en bloc kidney transplantation is a safe and reasonable option in transplantation surgery., In en bloc kidneys, for example, renal scintigraphy has been considered to investigate renal collecting system abnormalities in a previous study. Detailed estimation in marginal donors kidneys has been achieved by renal scintigraphy as in a previous study, in which all process could be evaluated effectively. In addition, rare incidental findings can be observed by renal scintigraphy in potential graft tissues such as carcinoma of the kidney. Cold ischemia time is considered as an important prognostic factor in the viability of graft function. The previous studies have shown that two kidneys of the same patients might have different acute rejection rates and serum creatinine levels. However, if the cold ischemia time is reasonable, their outcome will be similar.,, Another determinant is the delayed graft function which is associated with increased acute rejection incidence. Longer cold ischemia time is associated with higher delayed graft function. However, in a previous study, it has been concluded that, if there are no acute rejection episodes in the early postoperative period both cold ischemia time and delayed graft function do not predict graft dysfunction in the deceased donor kidneys. In a previous study which evaluated the effect of age and prolonged cold ischemia time in deceased donor grafts, increasing time to 24 h resulted in the delayed graft function but did not alter long-term function. However, grafts of older donors in that group survived three years shorter compared to younger donors. Another group of researchers found that history of hypertension and/or atherosclerotic disease was the only variable associated with graft loss. We feel that our study is of great importance because the effect of brain injury in the kidney tissue is not understood yet. If we can indicate the differences in the deceased donor grafts, we can better understand the prognosis of the graft in living patient. Thus, preoperative estimation of graft kidneys by renal scintigraphy can be recommended in the problematic kidneys of marginal donors. Limitations of this study are the short length of brain death time of rats which may be prolonged in real life. It would be important to evaluate the further effects of brain death in the kidney tissue with prolonged brain and kidney ischemia time in future studies. Acute tubular injury can possibly be the effect of brain death in the kidney tissue and may be the reason of high frequency of acute tubular necrosis in the deceased donor transplants and scintigraphy results can reflect these changes perfectly. Preoperative estimation of the kidney tissue which might be necessary in special circumstances (marginal donors) can be achieved by renal scintigraphy effectively. Abstract of this study was presented as a oral presentation in the 23th National Congress of Nuclear Medicine in 6-10 April 2013 in Antalya/Turkey. Barklin A. Systemic inflammation in the brain-dead organ donor. Acta Anaesthesiol Scand 2009;53:425-35. Simas R, Sannomiya P, Cruz JW, et al. Paradoxical effects of brain death and associated trauma on rat mesenteric microcirculation: An intravital microscopic study. Clinics (Sao Paulo) 2012;67:69-75. Jones SL, Viberti G. Renal functional reserve in subjects with diabetes mellitus. Semin Nephrol 1995;15:475-81. El-Maghraby TA, de Fijter JW, Wasser MN, Pauwels EK. Diagnostic imaging modalities for delayed renal graft function: A review. Nucl Med Commun 1998;19:915-36. Aktas A, Karakayali H, Bilgin N, Akkoc H, Moray G, Emiroglu R. Serial radionuclide imaging in acute renal allograft dysfunction. Transplant Proc 2002;34:2102-5. Bellomo R, Berlangieri S, Wong C, Thomson N, Atkins RC. Renal allograft scintigraphy with Tc-99M-DTPA – Its role during cyclo-sporine therapy. Transplantation 1992;53:143-5. Abe T, Saito T, Tsuchiya T, et al. Clinical usefulness of radionuclide angiography using 99mTc-DTPA-HSA in simultaneous cadaveric pancreas-kidney transplantation: A case report. Transplant Proc 2003;35:472-3. Gençoglu EA, Ayaz S, Yagmurdur MC, Moray G, Haberal M. Scintigraphic evaluation of paired renal allografts from the same cadaveric donor. Transplant Proc 2004;36:95-8. Hiramoto JS, Freise CE, Randall HR, et al. Successful long-term outcomes using pediatric en bloc kidneys for transplantation. Am J Transplant 2002;2:337-42. Gourlay W, Stothers L, McLoughlin MG, Manson AD, Keown P. Transplantation of pediatric cadaver kidneys into adult recipients. J Urol 1995;153:322-56. Strey C, Grotz W, Mutz C, et al. Graft survival and graft function of pediatric en bloc kidneys in paraaortal position. Transplantation 2002; 73:1095-9. Mahdavi R, Arab D, Taghavi R, et al. En bloc kidney transplantation from pediatric cadaveric donors to adult recipients. Urol J 2006;3:82-6. Memel DS, Dodd GD 3rd, Shah AN, et al. Imaging of en bloc renal transplants: Normal and abnormal postoperative findings. AJR Am J Roentgenol 1993;160:75-81. Gokhan M, Hamdi K, Alp D, et al. Evaluation of renal transplant recipients of paired cadaveric kidneys. Transplant Proc 1999;31:3119-20. Dunn EK, Distant DA, Strashun AM. Tc-99m MAG3 evaluation of recipients with dual adult cadaveric renal allografts. Simultaneous transplantation of both kidneys from marginal donors. Clin Nucl Med 1999;24:547-52. Lawrence SK, Van Buren DH, MacDonell RC Jr., Delbeke D. Carcinoma in a transplanted kidney detected with MAG3 scintigraphy. J Nucl Med 1993;34:2185-7. Guirado LL, Herreros MA, Díaz M, et al. Are there differences in renal post-transplant evolution between the first and the second recipient from the same donor? Transplant Proc 2002; 34:347-8. Peters TG, Shaver TR, Ames JE 4th, Santiago-Delpin EA, Jones KW, Blanton JW. Cold ischemia and outcome in 17,937 cadaveric kidney transplants. Transplantation 1995;59: 191-6. Lee CM, Carter JT, Randall HB, et al. The effect of age and prolonged cold ischemia times on the national allocation of cadaveric renal allografts. J Surg Res 2000;91:83-8. Michelon T, Piovesan F, Santos P, et al. Impact of using marginal cadaver donors and long cold ischemia time in renal transplant survival. Transplant Proc 2000;32:2586-8.